慈濟西雅圖人文學校學生參加美西北區華文學校聯誼會於 5 月 21 日舉辦的成語比賽榮獲佳績. This coming Saturday, 5/21, please join us to celebrate the past year of learning at Tzu Chi Academy, also give our best wishes to our graduates. 和往年不同的是, 今年我們把表揚班上特殊表現的同學在各班由老師來頒獎, 如最佳進步, 最佳勇氣毅力, 最佳微笑, 最佳人緣, 最佳助人等等, 期待在班級進行時, 老師可以有比較多的時間跟孩子們說明得獎的事由, 讓全班的孩子都能互相鼓勵. 考完期末考, 今天也是去年停辦後再舉辦的親子運動會, 從一周前就開始祈禱天公能作美, 到了接近活動時間, 老天爺開始飄其毛毛細雨, 總策畫黃士榮爸爸特別一身教練服很有魄力地說毛毛雨沒關係, 還是維持原計畫在戶外草地上進行。11:00不到, 各班已經集合完畢, 陸續進入場地玩遊戲, 不料雨勢越來越大, 爸爸團隊很快地將活動轉入室內球場並完成遊戲設置, 孩子們繼續各項體能遊戲. 們咬著牙用力拉, 一旁的爸媽也奮力加油, 看到快輸了, 還忍不住跳下去幫忙拉, 總之, 大家都拔得很開心, 輸贏已經不重要了. 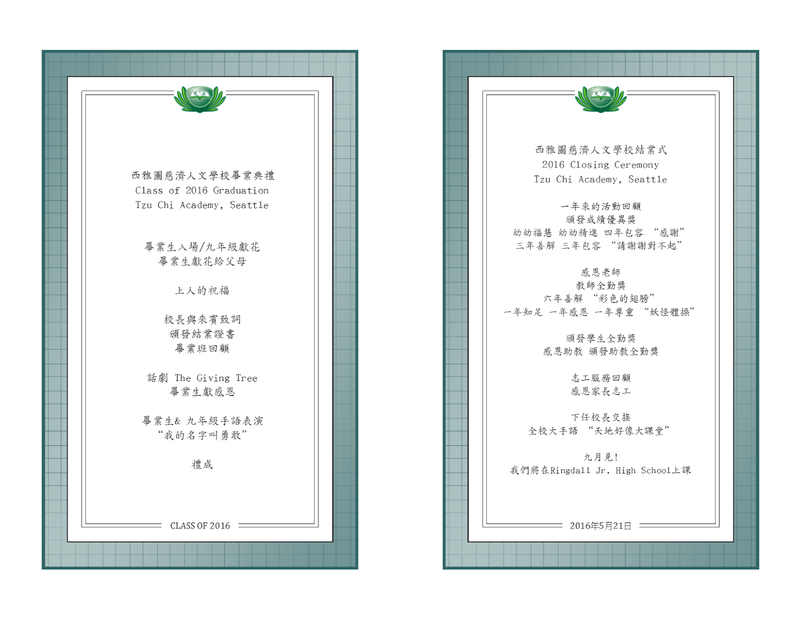 下周六是這學年的最後一周了, 我們將在 Bellevue High School舉辦結業式, 一起回顧一年來的點滴, 一定要來喔! 下周見! In Tzu Chi, May is a very special month and Mother's Day is also Buddha bathing day and Tzu Chi day. We are grateful for Buddha, our parents and all living beings. On May 7th, each class teacher will lead their students to present their learning portfolios of this school year to the parents at own classroom. All students will bring back their bamboo banks to school the same day. We are going to collect all savings and put forward the money to help the needed. Dear parents, your students have brought home their handmade invitation cards on April 16. Please come to the event and show your support to their education!